Now I may be using a little creative exaggeration here (not much), but I’ll wager dollars to donuts that any serious birder can interpret the above without skipping a beat1. But why do birdwatchers talk this way? I have several theories, but chief among them is that serious birdwatchers tend to be the sort of people who weren’t terribly popular in school2. In finding birdwatching, many such folks find a community, or a sort of club to belong to. The use of a code language allows one member of the club to identify another, and to assess the seriousness with which he or she pursues the sport. Connections can be made, friendships can be formed. It’s like a sort of birder mating ritual. The code can serve nefarious purposes also. Some birders use their lingo – intentionally or otherwise – to express a certain superiority over those less-versed in it. Fluency in this secret language allows me to talk over your head, then explain patronizingly when you don’t understand. As though my in-depth knowledge of abbreviations for bird names somehow confers a higher standing in society. You may be a neurosurgeon sir, but I know what an empid is. Check-mate. Unfortunately, whatever its intended purpose, this confusing vernacular can make birdwatching daunting to the beginner. There’s no dictionary to Birderese, and asking senior birders to define their terminology is intimidating. While there are many facets of this language to learn, one thing that really trips new birders up is alpha codes. Alpha codes (sometimes called AOU codes or banding codes) are standardized, 4-letter codes that refer to North American birds3. They are often used as shorthand in ornithological research, but many keen birdwatchers adopt them for their own field notes. Some also include them in public reports or even speech, confusing any readers or listeners who are not familiar4. For one-word names, use the first four letters: Ovenbird becomes OVEN. For two-word names, use the first two letters of each: Yellow Warbler becomes YEWA. For three-word names, use the first letter of the first two words, and the first two letters of the last: Yellow-rumped Warbler becomes YRWA. For four-word names, use the first letter of each: Black-and-white Warbler becomes BAWW. Trumpeter Swan and Tree Swallow should both be TRSW, so we use the third letter of the first name to differentiate: TRUS and TRES. Barn Owl and Barred Owl should both be BAOW, so we use the last letter of the first name to differentiate: BANO and BADO. Because of the ambiguity, and the difficulty in reverse-engineering bird names from the codes, alpha codes are really just an exercise in memory, and we can pretty much leave it there5. The reason for my lengthy dalliance down Lingo Lane, though, is that this week’s one-word-bird possesses a rare, if trivial, distinction. 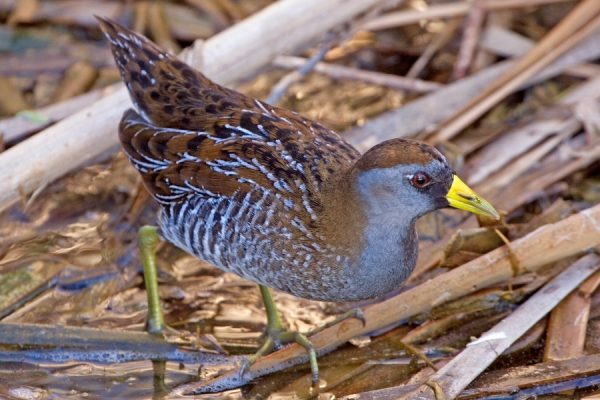 It is one of only two North American birds whose alpha code is its name: the Sora (alpha code: SORA). The Sora’s name is so short that people can’t seem to handle it, and many erroneously call this bird Sora Rail. As you can imagine, it rubs me very much the wrong way when people ruin a perfectly good one-word name with superfluous verbiage. Just Sora is fine, thank you very much. The Sora is indeed a rail (or crake, depending which word you prefer), which basically means it’s like a little, marsh-loving chicken. It has a plump body and small head, with stout legs and long toes for wading around in densely vegetated areas. It looks ridiculous, if we’re being honest, but in a truly delightful way. Right now you may be thinking that you’ve never seen a bird like this before, so it may surprise you to learn that the Sora is fairly common all across North America. 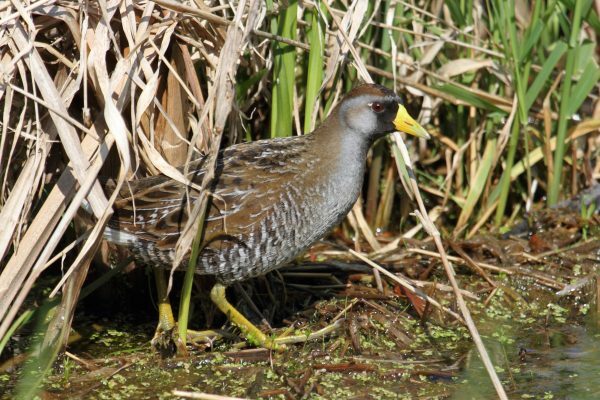 Imagine a wetland near you and chances are there’s a Sora in it, at least during the warm months. But rails, as a rule, are extremely cryptic, and there are plenty of seasoned birders who have never seen one either. The Sora always seems a little surprised that you can see it. Never fear though, for there is indeed a way to experience the secretive Sora: simply close your eyes and open your ears. The name “rail” comes from an Old French word meaning “to rattle,” and it only just begins to describe the diverse vocalizations of this family. Start listening to the calls of the Sora6, and you may begin to recognize some familiar sounds from springtime in your local marsh. Commit a few to memory, and you’ll begin picking these birds out in more places than you’d expect! Not much information exists on the origin of the Sora’s unique name. There’s just a vague suggestion that it likely comes from a First Nations language. I’m not entirely sure why it hangs on either, as the Sora is not that different from the other small, North American rails. Whatever the logic, the Sora is a little gift to new birdwatchers across this continent – a secretive bird that refuses to hide behind secret codes. 1North American birder, anyway. Dialect varies by region. 2Begrudgingly I include myself in this unfortunate group. 3Confusingly, when birders refer to North America they are often referring to the American Birding Association’s “ABA Area” which excludes Mexico. Birder geography…go figure. 4Some birders really love their codes! I once knew a dog named WIFL, belonging to a fellow who studied Willow Flycatchers.